Summerfield Quilting Club meets every Thursday at 12:30 PM in the Arts & Crafts Room. Bring your own project to work on and any items you want to share for show and tell. On the fourth Thursday of the month, we have an all-day work session beginning at 9:00 AM. This gives us more time for working on larger projects or making quilts for giving to local groups such as the Caring Closet. Do you want to exchange ideas or pick up new quilting techniques? 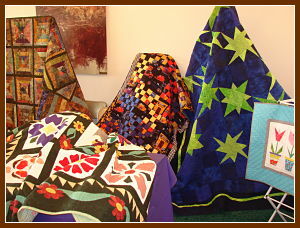 We have members of all levels of quilting experience. Come join us for an afternoon of fun, lots of conversation, laughter, and sharing of skills and knowledge.